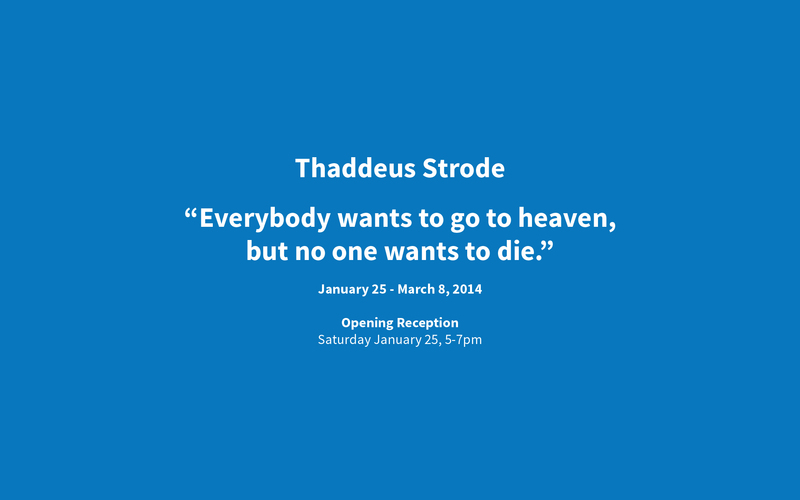 c. nichols project is very pleased to announce an exhibition of new works by Thaddeus Strode. “Everybody wants to go to heaven, but no one wants to die,” opens on Saturday, January 25th and will run through March 8th, marking the artist's first solo exhibition at the gallery. Thaddeus Strode often draws inspiration from the culture of his youth – punk rock, surf, and skateboard culture. He studied at the Otis/Parsons Art Institute and the California Institute of the Arts, earning a BFA degree from the latter in 1986. Much like an alchemist in a laboratory Strode combines elements of Zen philosophy, rock music, literature, and cinema into mixed-media installations that include paintings, prints, and sculpture. Strode appropriates from comic books and horror films, often merging the at times dark cultural landscape of Southern California with Hollywood film: images of the Manson family and Disney icons carry equal weight. Fantasy plays a key role in these experiments. Synthesizing a painterly style with disparate, enigmatic visions - villains, phantoms, and monsters join forces in a supernatural mix of horror and humor. At times grotesque, Strode portrays transitional characters through opposing styles and modes--figuration versus abstraction; expressive versus rational--in new and provocative ways. Thaddeus Strode’s work has been exhibited across the United States and internationally, including more than twenty solo gallery shows at the Kunstverein Heilbronn, Germany; neugerriemschneider in Berlin; Galerie Michael Janssen in Cologne; Galleria Gio Marconi in Milan; Cirrus Gallery in Los Angeles. In 2008 the Mildred Lane Kemper Art Museum presented Thaddeus Strode: Absolutes and Nothings. Recent group exhibitions include Sympathy for the Devil: Art and Rock and Roll Since 1967 at the Museum of Contemporary Art, Chicago; Imagination becomes Reality at the ZKM in Karlsruhe, Germany; KLF: Strictly Painting at the KLF Project Space in New York; and Funny Cuts: Cartoons and Comics in Contemporary Art at the Staatsgalerie in Stuttgart. He lives and works in Los Angeles. c.nichols project is open Wednesday through Saturday from noon-6pm. Please check the gallery website for details and additional programming or call 310-915-1930 during gallery hours. Press Inquiries: please contact Christine Nichols or Justin Cavin at info@cnicholsproject.com. c.nichols project is located at 12613 1/2 Venice Blvd, west of Centinela in Mar Vista. Ms. Nichols was formerly the owner and director of works on paper, inc. at 6150 Wilshire in Los Angeles.